Law firms, financial markets, IRS… Even the mighty IRS. We know by now that the blockchain has the power, at least in theory, to disrupt pretty much anything. 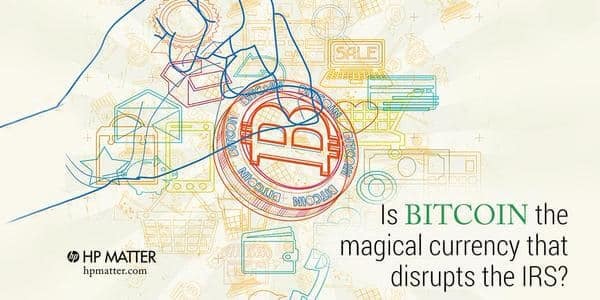 Even the digital giant Hewlett-Packard believes Bitcoin is a “magical currency”. 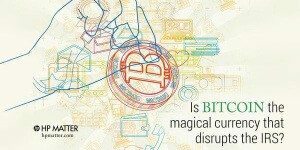 This is where Bitcoin’s ‘magical powers’ kick in. If a smart contract already looks like a quick and swift process, now compare it to the lengthy (and, honestly, tedious) traditional process that includes human lawyers, accountants, consultants and bankers. Yes, and the astronomical cost that comes with hiring these professionals. No offense, white collar workers, but the blockchain will eat you for breakfast. A smart contract processed by Bitcoin’s blockchain would be easy to access and understand, as well as cheap and, most importantly, impervious to fraud. The future is big and bright and the blockchain is starting to look like a tsunami that is likely to bulldoze the traditional financial markets and the current corporate structure. Sure, this process will destroy jobs. But it will also save billions for companies and individuals, as well as increase the safety and efficiency of transactions, HP says. The hard truth is that history is made of disruption. And, like Mark Twain said: “History never repeats itself, but it often rhymes.” Almost a century ago, Henry Ford’s progress in the auto industry and the prospect of mass production shocked and scared society. Human workers being replaced by machines, people losing their jobs… Yet, the markets were excited and the innovators wanted in on it. There was massive investment and new infrastructures were built, as society desperately tried to grasp the new reality. And then there was also a massive crash in 1929 and the world changed profoundly. But, then again, humanity also suffered the consequences of massive economic crashes after the explosion of railroads in the 1840s and the ‘steel mania’ of the 1880s. All this to say that, despite being painful for countries and its people, ups and downs are natural in the economic cycle all around the world. They sniff disruption like a trained bloodhound, but that doesn’t mean we don’t get to move forward and innovate. Despite the fear most uninformed people might feel when facing disruption, Bitcoin’s main obstacle when it comes to smart contracts might not even be ignorance. It can actually be one of its many relatives. 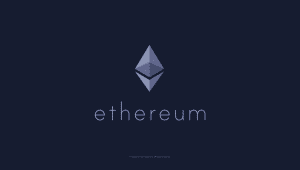 ‘Crypto 2.0’ Ethereum claims “it is the only game in town” when the topic is smart contracts. The not-for-profit platform allows developers to build out blockchain applications, while generating a token of value (called ‘ether’) to incentivise a peer-to-peer computation network. Ethereum might be very similar to Bitcoin, but it allows a bigger diversity when compared to Bitcoin’s ability to facilitate to smart contracts. “Every institution in the city I have spoken to is looking at Ethereum to build their blockchain apps for the next five to 10 years,” Ethereum communications officer Ken Kappler recently said, without revealing names. Still, most banks and companies still wear a frown when talking about smart contracts. The problem is the total transparency allowed by the blockchain. The solution will be to fork the system and create a hybrid system, a possibility that several institutions are researching.